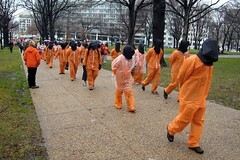 The London Guantánamo Campaign will hold a silent vigil to mark the 9th anniversary of the opening of Guantánamo Bay on Tuesday, 11 January 2011, from 1-2pm, at the top of Trafalgar Square (opposite the National Gallery). All London MPs and MEPs have been invited. Green London Assembly Members Jenny Jones and Darren Johnson have pledged their support. Liberal Democrat MEP Sarah Ludford also pledged her support and stressed that as vice-chair of the European Parliament’s US delegation she will continue to press Washington for the complete closure of Guantánamo and to lobby in London and Brussels for European cooperation in resettlement of men who cannot return to their home countries for fear of torture. Remember when people thought Obama closed Guantanamo Bay?